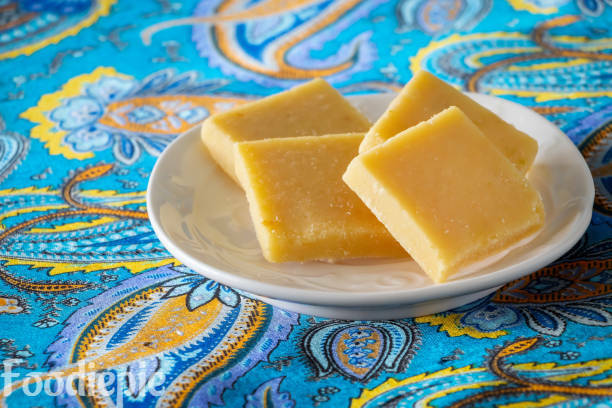 Khoya's Barfi recipe: Many types of dishes can be made from the Khoya and today we are going to tell that Barfi is very easy to make at home. Khoya barfi are very tasty to eat. cardamom powder and other ingredients gives extra flavor. This barfi can be eaten in the festival and other special parties.I have not used any garnishing but you can add pistachio,chopped almonds or chocco chips to look colorful and delicious as well. Step 1 : Make Mawa crumble or grated Heat the pan and add Mawa to it and roast the light brown while continuously. Step 2 : Put roasted mawa in a plate and keep it cool in room temperature. Step 4 : Keep stirring the syrup until it cools down. When it comes to freezing. Add a light warm Mawa to cool sugar syrup and mix well with a spoon. Add Cardamom Powder. Step 5 : Grease a try or plate with Ghee and transfer all mixture in it.Spread it evenly with the wooden spatula.Then If you want to garnishing then add pista,almonds,saffron strands etc. Step 6 : Leave it to cool completely for around 3/4 hours.After that cut the Pieces to your desired shape.Cut the pieces when prepared mixture is little warm otherwise it cool down completely then you will never get proper shape.if it is sticky then it means it is under cooked.Add milk powder and knead all the mixture well and make cut square Barfi pieces. Finally : The home made delicious Khoya Barfi is ready.Put Barfi in the air-tight container and put it in the fridge, and whenever you feel like taking the barfi and eat it, keep Barfi in the fridge for 8-10 days.